And here’s our last Kennerspiel 2012 nominee review. The award ceremony is almost upon us, so we’ll soon know which game had what it took to win. Village is an almost biographic game for me. I grew up in a place that resembles the village in the game very, very closely. Of course, technically, that was some hundred years after the game takes place, but you’d be surprised how little has changed in all that time. Except if you also grew up in a small, central european village. Then you wouldn’t be surprised at all. Maybe Inka and Markus Brand grew up in villages just like that as well, at least they have a deep insight into the lifestyle. In a village like that, everything is about the prestige of the family. You want the neighbours to have respect in their voice when they talk about you and your ancestors. And in the game, just like in real life, there is more than one way to do that, only that in real life you can’t conveniently express your renown in victory points. But to start with all your fameeply members – that’s meeple family members, I think It sounds good – are farmers. Not a glorious profession, but a necessary one, it’s generally considered good to have grain reserves. Your farm is painted on a small player board in front of you where your four first-generation fameeply members – easily recognizable by the one glued to the meeples – start the game. What did you think those numbers were, jersey numbers for the village football tournament? While having a farm is kind of nice, life mostly happens outside the farm, on the big village game board. The village board shows various locations around the village, and for each round these locations are filled with influence cubes. On your turn, you take one cube from the board and then take the action of the location you took it from. I haven’t even properly started the explanation, and we’re already looking at those tough decisions. As if picking an action wasn’t hard enough, you also have to decide which cube to take because the four colours of influence cubes are also the currency to pay for many actions. But placing cubes on actions is entirely random and the action you really want might not have the pink cube you need. So do you do something else and pick up that cube, or do you settle for another colour? Maybe you even want the action badly enough that you pick one of the black plague cubes – sooner or later, you’ll have to take one anyway, so why not now and take that action? The plague cubes are mixed with the influence cubes and spread across the village, but they aren’t a currency for anything. They just kill you, only a little, but they kill you: when you pick up a plague cube, you have to advance the time marker around the edge of your farmboard by two spaces. Every time that marker completes a round and crosses the bridge one of your fameeply members, lets put it gently, also crosses the bridge – but more on the dubious benefits of death later. When you finally decided on an action – depending on the player you have time to make coffee – you pick the cube and take the action. For the first two actions – first in the explanation, that is, you can choose all actions from the start – you don’t even have to leave your farm. You can harvest grain – two bags without help and tool, up to four with a plow and a draft animal – or grow your family, placing a fameeply member of the oldest generation still in your supply on the farm. Neither of those actions costs influence cubes or time, but cubes to pick from them are limited. Next, you can buy goods from a craftsman or have a fameeply member learn a craft. 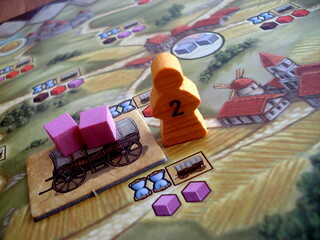 To buy goods, you pay in influence cubes or grain and take the corresponding goods: a wagon, plow, scroll, ox or horse. But no one really likes paying for goods, and when you know you will need, for instance, a new plow soon, it’s an old tradition in villages around the world to send one of the kids to become a blacksmith. It may cost a bit of time to learn the trade, and a bit more to make the plow, but it still beats paying. And when you need another plow later, you still have a kid that knows how to make them, so you get a free plow again. In game terms, when you train a fameeply member for a trade you move him from the farm to the workshop. The next time you need his product, you only pay the time it takes to produce – until he crosses the bridge. The mill is a special case of crafts, you cannot train your kids to be a miller, you simply pay some time to turn grains into coins here. It’s a bit Rumpelstiltskin if you ask me, but coins are worth victory points at the end of the game and can replace influence cubes when paying for things, so a deal with a fairytale character is a reasonable way to get them. The goods produced can be used for yourself – the plow and draft animals on your farm, for example – or they can be sold at the market. Every round only has one market day, triggered by someone taking the single cube from the market action. Always before I produced everything I was planning to sell. The rules might as well read “when Kai produced the goods he wants to sell, go back one turn and start the market day”. The problem might be my own lack of foresight, too, the customers don’t show up on market day as a surprise. Every market day has five customers that can be served, in turn by all players, but the next five customers are also visible. So don’t play like me, watch what others are making and produce for the demand of the future. Customers don’t pay you in coins, they just take your stuff and give you points at the end. If you didn’t grow up in a village that may seem strange to you, but I assure you it’s perfectly normal: give free stuff to people so they’ll tell everyone how great your family is. Happens all the time. If that sort of thing annoys you, maybe it’s better to leave the village behind altogether and go see the world. Travel to far-away exotic places like that town over there, maybe even the town behind that, and if you’re a real globetrotter all the way to the city. That, too, didn’t change much since the time of Village – anyone from my village that had seen more than two of the surrounding towns was considered restless and adventurous. Travelling is expensive, it costs influence cubes, time and a wagon for every road that your man goes down. Yep, a new wagon every time. We had roads like that where I’m from as well. Besides being expensive, travelling is also the single biggest source of victory points. If your family has been to all six mysterious, dangerous places in the countryside that’s worth 18 points, plus the reward each town gives you for visiting. Finally, your fameeply members can start what we’d call posh careers back then: as member of the village council or a clergyman. Picking the council chamber lets you send someone from your family to the council, advance him in rank there or let him use one of the council privileges: become the new start player, get free influence cubes or goods or pay coins for victory points. Being a council member is also a job out of the rain with no heavy lifting involved, so do your kids a favour, send them to the council. The other posh career is even more glorious. When you pick the church action you may place one of your meeples in the bag. Yes, the bag. Contain your excitement for a moment, it gets better. Because when the round is over – after all cubes have been picked from the board – a mass is held. That’s a slight difference from my childhood, we used to be more wasteful and have masses weekly. In the mass, four meeple come out of the church bag again. Either randomly, or picked by bribery – that is, you can pay one coin to find one of your meeples in the bag. 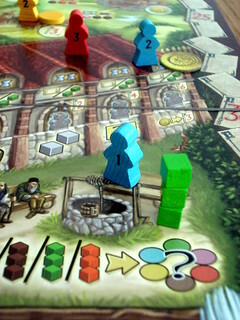 Later in the game, that often means that no meeple are drawn randomly. How did that saying go? God helps those who help themselves? The church has four ranks, newly unbagged priests obviously start at the lowest, and can then pay grain to advance. Going to the highest rank costs a total of seven bags of grain, but every bishople here is worth six points when the game ends. I call them bishoples because there can be more than one of them, so they can’t be poples. Additionally, after each mass the player with the most priests in the family earns bonus points. Now we talked about all the things your fameeply members can do while they’re alive, but what happens when they cross the bridge? Every time the time marker crosses the bridge, one meeple from the oldest living generation dies – that’s why it’s generally a bad idea to promote someone really old to be a bishople, chances are he won’t see the end of the game in that rank. Dead family members are remembered in the village chronicle for their specific merits as long as there is still space for them. The first few dead farmers, for example, find a place in the chronicle under ‘F’ for ‘Farmer’ – any farmer that dies later, even if he was a great farmer and crops were sprouting rom his footsteps – will just find a place in an unmarked grave where he’s not worth victory point. The same applies for craftsmen, travellers, politicians and the clergy. When the game is over, points are awarded based on the number of your meeple in the chronicle: the more, the higher. So letting some fameeply members die early in the game is actually a wise investment. Live fast, die young, score high. The game ends with a final mass when either the chronicle or the graveyard are full. Village really covers all the major routes to fame in a small village – except for piling up all the village’s outhouse doors in the village square, a story my father loved to tell – and that means that you start out being overwhelmed by options. We’re talking about a Kennerspiel des Jahres nominee here, so that’s a good thing in my eyes, it’s perfectly okay for a game to take a party or two before it opens up to you. Village does open up after the second game or so, but that only means you’ll understand how all the actions interact, not how to win the game. The idea of having more than one way to victory has been implemented well here and there is no one winning strategy. Too much depends on which cubes show up where and what the other players are doing. You might win a game with a fameeply that dies like mayflies but leaves their fingerprints all over the village chronicles, or with a fameeply that never kills all members of the first generation, but has their hands in church and council. In most turns it’s very much not obvious which cube and which action will do you the most good – unfortunately, there are also turns when you know that none of the remaining actions are any good for you and you just pick a cube because you have to. But those don’t happen to often. Because there is no trade between players, no agreements, no alliances it’s easy to think that Village has little interaction. But that’s not so, what the others are doing has to have a great influence on your strategy if you want to win, two players trying the same strategy can be almost sure to hand victory to the third. Village is easily the most complex game in this year’s Kennerspiel nominations. There are many factors to consider, many little things to keep in mind – and many details to learn for your first game. But while the whole game seems a little to heavy on the details at times, everything is there for a reason, all the details make sense. 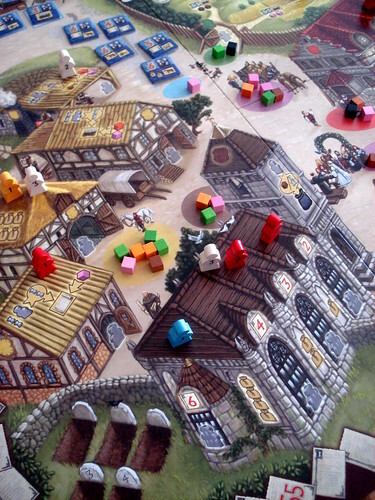 And while there is some luck involved in Village – mostly what cubes go on which action, but also drawing meeples from the church bag – this is a game where you’re not savaged by bad luck, you win by being best at managing it. 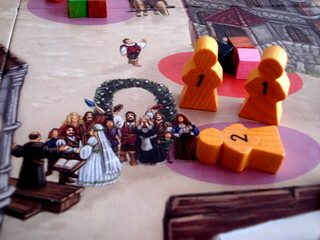 The Kennerspiel des Jahres decision will boil down to this: does the jury look for complex rules in a Kennerspiel – then Village is certain to win – or are they looking for games with simpler rules that are still challenging to play, in that case the Kennerspiel will be called Targi or K2. 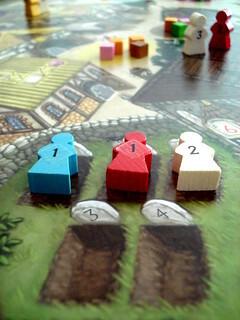 UPDATE: Village is the Kennerspiel des Jahres 2012!